Announced earlier today, Dead Rising 4 is coming to the PlayStation 4 in the from of Dead Rising 4: Frank’s Big Package. In addition to being the complete package with all DLC, the game will be getting more than a dozen Capcom heroes for Frank West to not only dress up as, but take on some of their powers as well. Capcom detailed this new addition when they announced Frank’s Big Package. While obviously, the main attraction is the core Dead Rising 4 experience, the studio has been busy working on the all-new Capcom Heroes addition. 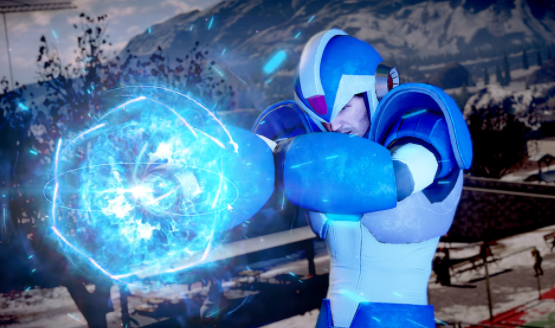 Being able to play with the powers and costumes of some of our favourite Capcom characters has been really fun and we think players are going to get a kick (or punch!) out of it too. We’re going to be rolling out over a dozen heroes that Frank will be able to embody in the game, but so far, we’ve shown Sissel from Ghost Trick, X from the Mega Man series and Street Fighter’s Cammy. We already know that the Dead Rising 4 Capcom heroes will include Street Fighter’s Cammy and Zhangief (seen in screenshot above), Mega Man X, and Sissel from Ghost Trick, but with at least eight more heroes to be announced, we couldn’t help but think about suggestions for where Capcom could pull in additional ideas. Capcom has a library of fascinating, powerful, and goofy characters that could all help make Frank West look fabulous and take out the undead with style. These are the Dead Rising 4 Capcom heroes that we’d love to see Frank West take on the persona of when Frank’s Big Package comes out later this year. This is just the latest in announcements of crazy video game crossovers this week, including Sonic Forces getting costumes for other Sega and Atlus characters, and Final Fantasy XV getting Assassin’s Creed DLC. We took the opportunity to detail some other crazy video game crossovers we’d like to see, and apparently Capcom didn’t want to be left out of the fun. Did we miss any Dead Rising 4 Capcom heroes that you want to see Frank West become later this year? Be sure to throw your suggestions for outfits and powers in the comments below.